I’ve had several customers bring their 2012 Macbook Pro 13″ laptops to me with the same issue. Their MacBook Pro randomly crashes, shuts down or beeps on start up. Pressing more firmly on the casing next to the left side of the trackpad seems to cause these crashes. The first and most logical conclusion is that the RAM or memory modules are acting up. Mac laptops are very particular about the type of memory they will accept. If your Mac laptop begins to behave strangely after the memory has been upgraded, the memory modules themselves are usually the problem. However, I have seen the random crashes, shutdowns and beeping persist in 2012 MacBook Pro 13″ laptops even after the RAM has been replaced. What I’ve found to be the culprit is not the memory modules, but the trays or slots where the memory modules are held. There are two slots for the memory shown below. The slots sit directly beneath the casing by the left side of the trackpad. This is why the MacBook Pro randomly crashes when the palm rests or presses more firmly in this area, especially if the upper of the two slots has failed. Unfortunately the memory slots cannot be replaced without replacing the entire logic board. Luckily though, usually only one of the slots fails. 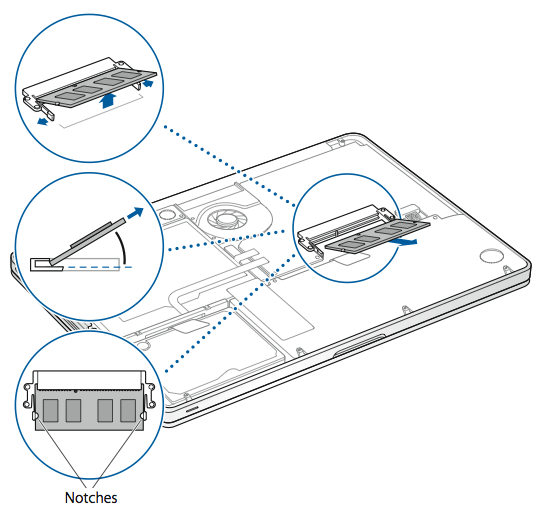 Therefore shifting the memory into the functioning slot and leaving the failing slot empty is a workaround that keeps the laptop running without a costly logic board replacement. For example if your MacBook Pro has a total of 4GB of RAM, you have two memory modules of 2GB each. A replacement 4GB module can be installed in the functioning memory slot, and your laptop performance won’t be compromised. The 2012 MacBook Pro supports up to 16GB of RAM, which means using a single 8GB module is possible. You can even use the RAM slot issue workaround as an opportunity to upgrade your memory from 4GB to 8GB.